Is Windows 8 and RT Doomed to Fail Against Android? Microsoft is trying to push hardware manufacturers to either adopt Windows 8 or the RT operating system on their tablets. The Redmond based company is facing an uphill battle where it is unable to compete against Android in the battle of tablet operating systems. Earlier in the year, Microsoft surprised all of its vendors and hardware partners by announcing that it would compete against them by releasing the Surface RT and then the Surface Pro. Most companies actually heard it from the media first and ill-will started to form against Microsoft. Most people had assumed that Microsoft was too big to fail and that it would throw enough money at a huge marketing campaign to sell enough units. Obviously, this did not solve any problems and recently Microsoft took a $900 million dollar loss on the entire Surface fiasco. Word has it Surface sales were quite abysmal, selling 1.5 million units total. One of the big barriers preventing companies competing against Android with Windows would be price. It costs over $90.00 for an RT license and Windows warrants very specific ARM, RAM, battery, and overall hardware requirements to run all of the apps flawlessly. Once you account for the operating system and all of the bloatware, there is normally only 8 GB of memory for the user to play with, which doesn’t do very much in today’s world. The very fact that Microsoft makes OEM developers pay the extra $90 to license Windows RT is a recipe for failure. Normally, you can buy entry level Android tablets for the price of a Windows license. This puts your average Windows tablet over the $300.00 price point and many people are instead gravitating towards the Kindle Fire, Nook HD, or Nexus 7 at half the price. 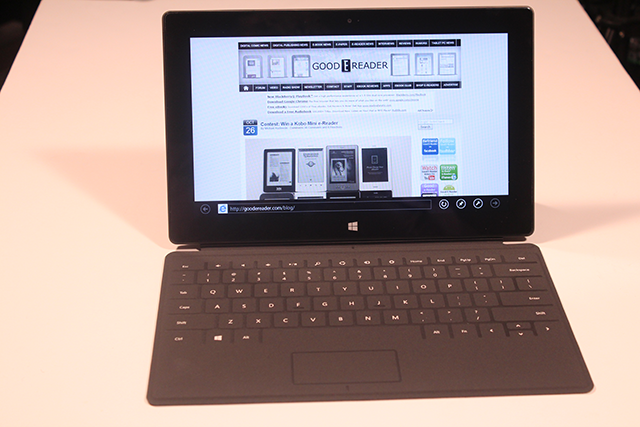 The lack of sales has prompted many companies from not even entering the market with Windows 8. Lenovo has not officially announced anything, but it has discontinued the YOGI tablet and the recently released Acer W3 has already been discontinued, two weeks after launch. Ecosystem is everything and no one is paying for Windows 8 apps. The Microsoft Windows 8 app store is rife with cheap knockoffs and clones. In the rare case you have a great first party app like Zinio or Nook, Microsoft actually had to pay them to develop an app for them. B&N was paid close to $300 million dollars to make an app for Windows 8 and Windows Phone 8, Zinio was paid an undisclosed sum to make an app for both platforms, by way of Microsoft and Nokia. Since no one is paying for apps, most are free and are being supported by in-app advertising. Most advertising is done via Bing Ads and Microsoft themselves were buying ad slots in order to generate revenue for developers. This continued until March 31, 2013 and advertising revenue has gone from barely tolerable to essentially zero. If you make an app for Windows 8 at this point and you depend on ad revenue, you will not make money. This has zero chance of changing unless Microsoft literally starts buying their own ad slots, and that is simply unsustainable. Even then, it isn’t worth writing an app for, if Microsoft changes their mind, you are dead. Would you base your business model on Microsoft’s whims? Would you invest in a company that did? Zune anyone? In order for Windows 8 and RT to have any semblance of a chance against Android in the global marketplace a few things need to be done. The company needs to essentially give OEM licenses away for free to reduce costs and allow the tablets to compete against Android on price alone. Microsoft must also vow to not compete against its own OEM’s and discontinue making tablets on their own. Finally, they need to revise the way in-app advertising works and allow buyers to target tablets exclusively, instead of generically advertiser on Bing and Yahoo, in addition to mobile devices.